Exposure to risk of predation is a common consequence of foraging and other activities, and thus individuals will benefit from adaptations that minimize predation risk while maintaining energy intake. Predator avoidance takes many forms (Harvell 1990) and often reflects the need to balance foraging opportunities with survival (Sih 1987). Some avoidance mechanisms operate regardless of the physical proximity of predator and prey and serve to reduce the likelihood of initiation of an attack, whereas others function to foil attack and capture. Antipreda-tory traits can be fixed, such as protective armor or invariant nocturnal activity, or induced by the presence of the predator, such as fleeing after tactile or visual contact, or perceiving the ''scent of death'' when waterborne chemicals reveal a predator's presence (Kats and Dill 1998). Flexible predator avoidance requires some ability to assess risk and make an escape, and so fixed responses may be favored when those conditions are not met (Dill 1987) or the cost in lost foraging opportunity is modest (Dixon and Baker 1988). Because predation can rarely be entirely ignored or eliminated, threat-sensitive predator avoidance behaviors should be a widespread solution to the trade-off between foraging and avoiding being eaten (Lima and Dill 1990). Many examples attest to the prevalence of antipredator adaptations among aquatic organisms. Cooper (1984) found that adult water stri-ders (Gerridae) occupied all areas of stream pools when trout were absent, but only the margins of pools that contained trout. When trout were removed from some pools and transferred to others lacking trout, gerrid distribution adjusted accordingly. Similarly, juvenile crayfish Orconectes propinquus, the preferred prey of fish such as smallmouth bass, avoid open, sandy substrates where larger and less vulnerable crayfish are abundant (Stein and Magnuson 1976). Many stream fishes avoid habitats that pose high risk coupled with high reward, and instead forage in less profitable patches where risk of predation is less (Cerri and Fraser 1983, Power 1984a). Peckarsky (1996) describes alternative predator avoidance syndromes by mayfly species that she relates to a continuum of mobility and predation risk. 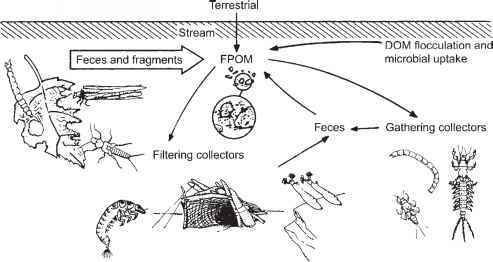 Predaceous stoneflies in Rocky Mountain trout streams consume the swimming mayfly Baetis in high frequency, the surface-clinging heptageniids Epeorus and Cinygmula with lower frequency, and the benthic crawler Ephemerella least of all. The agile Baetis quickly departs when encountered, using the water column as an escape route and sacrificing foraging opportunity in doing so, whereas the hepta-geniids are less prone to drift in response to encounters. Ephemerella has a spiny and rigid exoskeleton and arches its body in an apparent defensive reaction on contact with a predaceous stonefly, and this rather than escape provides its main defense.